Meal prepping is a concept that is talked about a lot these days. 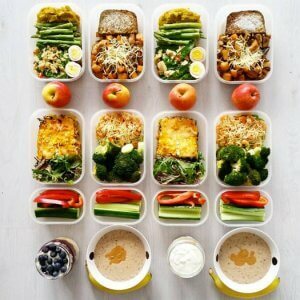 Fitness professionals and medical weight loss experts alike all recommend meal prepping for those who are trying to lose weight or adopting a healthier lifestyle. The programs at New Results Medical Weight Loss are extremely successful, because we are focused on our clients’ entire journey through the process, from the medical supplementation, the accountability, and the healthy living tips. Here are 5 of our favorite tips for meal prepping. Pick Food That You Enjoy! This might sound obvious, but when you are preparing meals ahead of time, make sure that you are cooking foods that you will enjoy eating. If you hate fish, don’t prep fish! There are so many healthy options for foods to cook. Cook Bland Foods in Bulk. Cook foods in bulk that you can add some variety too. One of our favorite recommendations is to cook several chicken breasts in the crockpot at once. Then, throughout the week you’ll be able to enjoy variations of shredded chicken. You can add a low-carb BBQ sauce and make BBQ sandwiches, add teriyaki sauce and stir-fry veggies for an Asian-inspired dish, or add salsa for quick and easy chicken tacos. Is there a recipe that you’ve always wanted to try? This is a great time! Meal prepping doesn’t need to be boring. Trying new recipes can be a great way to keep you excited about meal prepping. While you are preparing the foods, listen to a podcast or your favorite music. When you make it fun, meal prepping can become one of your favorite parts of the week. Think about your protein, fats, and carbs. Make sure that the meals you are preparing are balanced and close to your recommended intake numbers! We generally recommend foods that are lower in carbs (think cauliflower rice instead of traditional rice), but speak to our team to learn more about the best food for your body! Some of our patients say that they don’t really enjoy eating the same foods every day. And we understand that this can be a bit of a transition. But remember why you started and how far you have come in your weight loss journey! Food is fuel for your body. Meal prepping can be a great way to stay ahead of your weight loss goals! We have many clients at New Results Medical Weight Loss that love meal prepping and have implemented it a part of their regular routine. Learn more about our medical weight loss programs.